This guide is designed to assist you when sending RTI returns to HMRC. When do I submit my first RTI return? 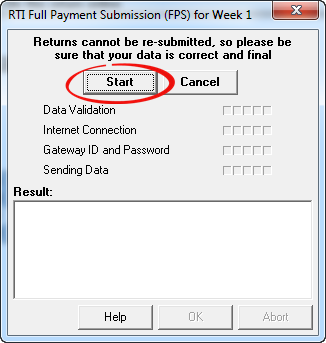 Your first RTI submission is due on (or before) your first pay day. e.g. If you pay your employees weekly on a Friday, then your first RTI return should be sent on or before the first Friday that you make payments to employees. If you pay employees monthly on the last day of the calendar month, then your first RTI return should be sent on or before the last day of that month. What information will I be sending in RTI? There are a number of different submission types that make up RTI filing. The ‘main’ types are the ‘Full Payment Submission’ (FPS) and the ‘Employer Payment Summary’ (EPS). Payroll Manager is able to determine which submission types are due at any particular point in time, and manages the submission of these returns via the ‘Employers RTI Schedule’ screen (details of which follow later in this guide). The FPS is the ‘main’ submission type, and is sent each time that an employer pays their employees. So if employees are paid monthly you send 12 FPS submissions per year, if employees are paid weekly you send 52 FPS submissions and so on. The FPS contains details of all employees that are being paid in that particular pay period, and includes details such as their tax code, gross pay, tax deducted, NIC, student loans and parenting pay (SMP, OSPP, ASPP etc.) together with their year-to-date figures. Payroll Manager also includes the details of employees with the same pay frequency that are not being paid in that particular period, providing HMRC withy their Year to Date totals.. If during any one PAYE month an employer has statutory payments to recover (e.g. for Maternity pay etc.) or has suffered any CIS deductions then this information is reported to HMRC via the Employer Payment Summary (EPS), which is sent as necessary on a monthly basis. An EPS is also required if there are no FPS returns in a particular month beacuse the employer has no active employees entered in the system. If there are employees entered but they are not being paid then Payroll Manager sends an FPS return to indicate this rather than an EPS. Moneysoft Payroll Manager is able to automatically determine whether or not an EPS is due, and prompts you to send it at the relevant time. Make sure that your data is accurate and complete. Enter the details of new starters and leavers. Make sure that you have entered the details of all employees that have joined or have left your employment since the previous pay period. This starter and leaver information is sent to HMRC as part of your RTI submission. To add new employees click ‘Employees – Add new Employee’. To mark someone as a leaver, click ‘Employees – Employee Details – Work’ and enter the employee’s leaving date. Also ensure that you remove any pay that may be entered on the ‘Pay Details’ screen for this employee in pay periods after their leaving date. HMRC have introduced a new data item for RTI called ‘hours worked’ where you are asked to report the number of hours an employee would normally work in a week. Click ‘Employees – Employee Details – Work’ and choose one of the following bands from the ‘Hours worked’ drop-down menu: : ‘A: Up to 15.99 hrs’, ‘B: 16 to 29.99 hours’, ‘C: 30 hrs or more’, or ‘D: Other’. Payroll Manager sets this field to ‘D: Other’ for all employees by default, so you may decide to take some time in setting this field accurately for each employee before sending you first RTI return. Make sure that you have entered the pay details of each employee that is due to be paid in this period. 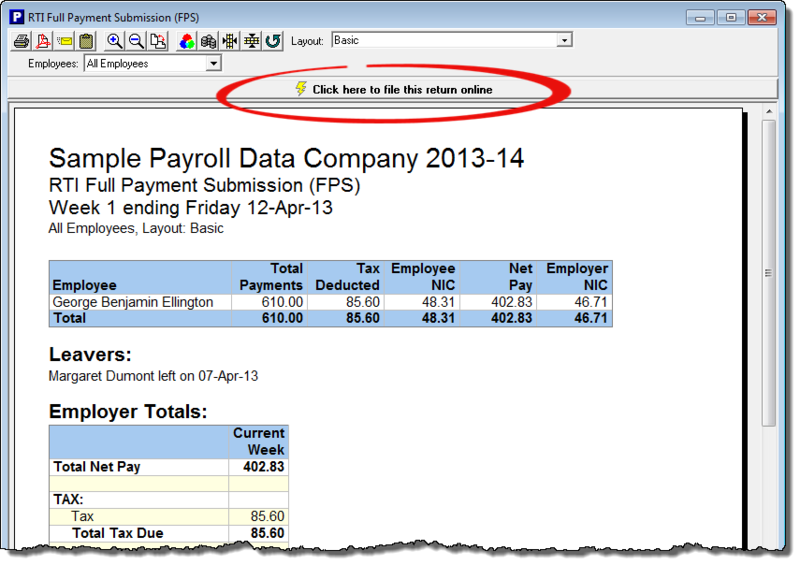 Click ‘Pay – Pay Details’ to add or edit pay. Enter any statutory pay that may be due. Sick, Maternity and Paternity pay is all entered on the ‘Calendar’ screen. If you have employees that are due to receive statutory pay then check that you have entered up-to-date information by clicking ‘Employees – Calendar’ from the menu. Make sure that you have finished entering any Pension contributions that the employee(s) may be making to your workplace pension scheme. Once you have finished entering the pay details for all employees then you are ready to send your first RTI submission. 1) – Click on the button to show the ‘Employers RTI Schedule’, and then click the ‘View / File’ button for the relevant period. 2) You will see the ‘RTI Full Payment Submission (FPS) report’ for that period, which shows the pay details of each employee being paid in that period, together with a list of starters and leavers (if applicable). This report also shows details of employees that are NOT being paid in this period, which serves as ‘double-check’ that you have entered each employees pay correctly. After checking the details on this report click on the bar marked ‘Click here to file this return online’. (Note: If the text says ‘online filing blocked’- then click for details and fill in the missing data). 3) Sending the submission: – The following window will appear – Click ‘Start’ to file the FPS. The ‘outstanding’ status indicates that the submission has been received by the Government Transaction Engine. Click ‘Check for responses’ to view the HMRC response. (Note: Normally you can expect HMRC to respond within a matter of seconds. However, under certain circumstances (e.g. busy periods, system maintenance etc) HMRC may take a number of days to respond. In such cases you can choose to ‘Check later’, and then come back to the program and check for responses at any time during the next 30 days). Click ‘OK’ and the screen will show that there are no outstanding submissions. Click ‘Close’. 5) – You can then print a copy for your records. And that’s it – you have successfully filed your first RTI return! If you should ever wish to see a historical record of the RTI submissions that you have sent, then click ‘Tools – Online Filing – HMRC filing log’ to display a list of all submissions sent in the current tax year. Note: If an EPS is due for a particular month then Payroll Manager will automatically add it to the ‘Employers RTI Schedule’. The EPS (if present) can be filed using the same method as described above for the FPS. An EPS will only appear in the schedule if it is necessary to send a return for that particular month. If an EPS is not required then it will not appear in the schedule.